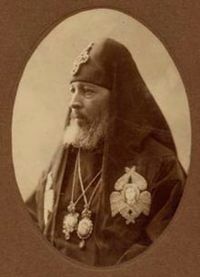 The holy, glorious and right-victorious New-Hieromartyr Kirion II (Sadzaglishvili) was the first ruling bishop of the restored autocephalous Church of Georgia. He was installed as Catholicos-Patriarch in September 1917. He was found murdered on June 27, 1918, amidst the turmoil of the socialist upheaval caused by the Bolshevik revolution in the Russian Empire. He is commemorated on June 27. George Sadzaglishvili was born into the world in 1855 in the Georgian village of Nikozi. His father was a priest. His education progressed through early studies in the parochial school in Ananuri, followed by attending classes in the theological school in Gori, before he finished his early studies in the Tbilisi Seminary. He continued his education at the Kiev Theological Academy, graduating in 1880. He was ordained to the clergy. After graduation he returned to Georgia and entered a career of administration of education within the Georgian Church, particularly in Gori, Telavi, Kutaisi, and Tbilisi. He also contributed to Georgian literary efforts through writing and organizing libraries as well as participating in archaeological projects. In 1886, George was tonsured a monk with the name Kirion and was installed as abbot of the Kvabtakhevi Monastery. He was also raised to the dignity of archimandrite. In addition to his spiritual duties and labors, Arch. Kirion continued his literary efforts, including publishing articles on the history of the Georgian Church, folklore, and literature, as well as collecting ethnographic materials from ancient Georgian churches. In 1898, Arch. Kirion published a study of the historical monuments of the Liakhvi Gorge that became an important research source as many of the monuments were later destroyed by Georgian enemies. In August 1898, Arch. Kirion was consecrated bishop of Alaverdi, and immediately began restoration work on the Alaverdi Church for which he used much of his own resources. He also continued archaeological efforts in eastern Georgia, particularly in Kakheti and Hereti. Among the artifacts he recovered was a Holy Gospel from 1089 that had not been known to scholars. In 1901, Bp. Kirion was installed as bishop of Gori. By the early twentieth century, Bp. Kirion became the favorite among the clergy of the Georgian exarchate in their efforts to restore autocephaly for the Georgian Church. Recognizing his popularity, the Russian government frequently transferred Bp. Kirion to different parts of the Russian Empire in order to blunt his influence. Starting in 1903, he was transferred in succession to Cherson, followed by a move to Orel in 1904, and in 1906 a transfer to Sokhumi. In Sokhumi, he exerted every effort to restore and revive Georgian churches, which resulted in his transfer to the Kovno diocese. In 1905, the Russian government formed an extraordinary commission to formally consider the question of autocephaly for the Georgian Church and thus satisfy Georgian demands made under the leadership of St. Ilia (Chavchavadze) the Righteous. Bp. Kirion gave two presentations to the commission on the Georgian struggle favoring restoration of autocephaly. However, the Georgian claims were rejected by the commission, and the Georgian leaders were repressed harshly. Repressions came heavily on Bp. Kirion. He was denied permission to attend the funeral of St. Ilia after his assassination in 1907. In 1908, he was accused of conspiring in the murder of the Exarch, Nikon, for which he was deprived of his rank as bishop and arrested. These actions brought indignation from both the Georgian and Russian people, as well as from democratic elements in Europe. In 1915, the government repression on Bp. Kirion came to an end. His rank as bishop was restored, and he was elevated to Archbishop of Polotsk and Vitebsk in western Russia. However, he was not allowed to return to Georgia. With the fall of the Romanov dynasty in Russia, the Georgian Church declared its autocephaly in March 1917. In response to the demands of the Georgian people, Abp. Kirion returned to Georgia. He was welcomed back warmly and was met with great honors on his arrival in Tbilisi. In September 1917, Abp. Kirion was enthroned by the Holy Synod of the Georgian Orthodox Church as Kirion II, Catholicos-Patriarch of All Georgia at the Svetitskhoveli Cathedral. Georgia celebrated its declaration of independence on May 26, 1918, after which Catholicos-Patriarch Kirion II celebrated a service of thanksgiving the next day, however, the perception that the imminent rising of Bolshevik power would pose a great threat to the Georgian republic and its Church. On June 27, 1918, Kirion II was found murdered in the patriarchal residence in Martqopi Monastery. The guilty were not identified after a formalistic investigation was conducted. On October 17, 2002, the Holy Synod of the Georgian Apostolic Orthodox Church canonized the Holy Hieromartyr Kirion II, numbering him among the saints. This page was last edited on October 23, 2012, at 19:28. This page has been accessed 17,644 times.